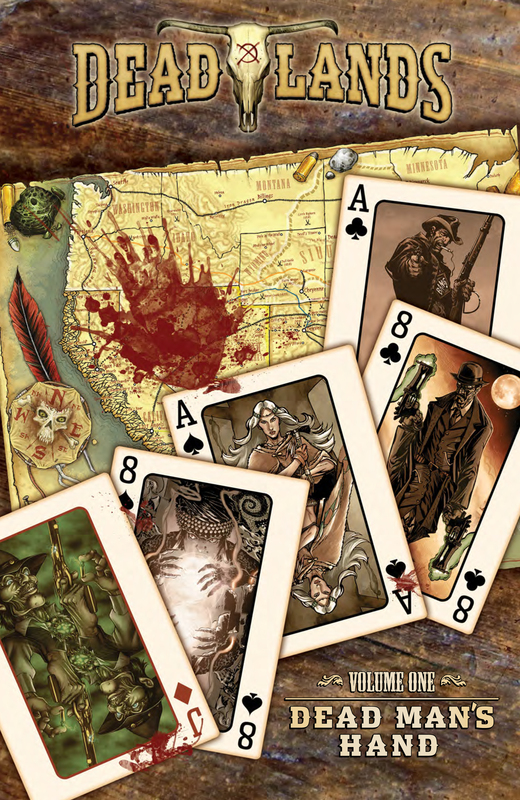 Get ready, as award-winning publisher IDW brings Dead Man’s Hand, the first original collection of the hit Deadlands series to comic shops in March 2015! Based on the popular Deadlands RPG, created by Shane Hensley and Pinnacle Entertainment, and produced by Visionary Comics, the series embodies all the best of horror, western and steampunk in a world filled with creatures of the night, mad science and mysticism! Deadlands Volume 1: Dead Man’s Hand brings together a who’s-who of superstar horror-western comic talent to launch this unique series that laid the groundwork for every horror-western series since! Join High Moon’s David Gallaher and Steve Ellis as they tell the tale of a cursed weapon created to kill the devil in Devil’s Six Gun. Journey with All-Star Western’s creators Jimmy Palmiotti and Justin Gray, and Shinku’s Lee Moder on a young Shamaness’ quest for vengeance in Massacre at Redwing. Duck low for Witchblade’s Ron Marz and Superman / Wonder Woman’s Bart Sears as they tell of a heroic ranger who sets out to kill a whole town in Death Was Silent. Then dive into Desperados’ Jeff Mariotte and Golly’s Brook Turner’s love tale drowned in horror in Black Water. But that ain’t all! For the first time in the comic market, this volume contains two brand new short stories penned by Deadlands creator Shane Hensley and Brand Manager Matt Cutter, who show us What a Man’s Gotta Do and how to be Vengeful. And for the first time ANYWHERE, get an exclusive sneak peek at the first, original Deadlands novel, Ghostwalkers by New York Times’ best-selling author Jonathan Maberry, to be published by Tor Books in Fall of 2015! This amazing new adventure launches the new Tor novel line for Deadlands scheduled with releases into 2017!